By leveraging Gemalto worldwide research and development we are able to concentrate our attention on turning innovations into quality, advanced security solutions. As a partner, we focus on delivering customized integrated solutions based on a sound understanding of both your challenges and the requirements of your issuance and authentication systems. As the complexity of personal identification grows and new security mandates arise, we continue to evolve and grow our capabilities and competencies, developing solutions for aspects of the secure identity process through leading innovation, strategic acquisitions and long-standing partnerships. Quickly and reliably inspect, authenticate and capture data from electronic travel and identity documents with our next generation document reader, the Gemalto Document Reader AT10K. Designed for reading of passports, identity cards, driver’s licenses and barcoded documents in both government and commercial applications such as banks, retail and transport. Watch the video! Discover the Gemalto AT9000 MK2 Document Reader - a familiar sight at border control desks around the world – Easy and accurate. Gemalto KR9000 full page document reader to quickly read and process images from documents and epassports. Read ALL passports in the world issued after 2005 and other ID documents such as US Green Cards, visas, etc. 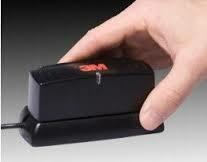 with the Gemalto CR100 MRZ Swipe Reader.